As Seen On TV Bacon Master cooks crispy bacon in the microwave in just minutes! Delicious bacon without the mess. The Bacon Master The Bacon Master cooks bacon faster than the traditional method, produces bacon that is not ridden with excess oil and fat, and creates less of a mess, and creates less of a mess. The Bacon Master cooks bacon so well in the microwave, that there&apos;s no telling it wasn&apos;t cooked in the frying pan. The Bacon Master makes healthier bacon. The meat cooks above the fat, not in it. Less fat and less grease equals better health for you. 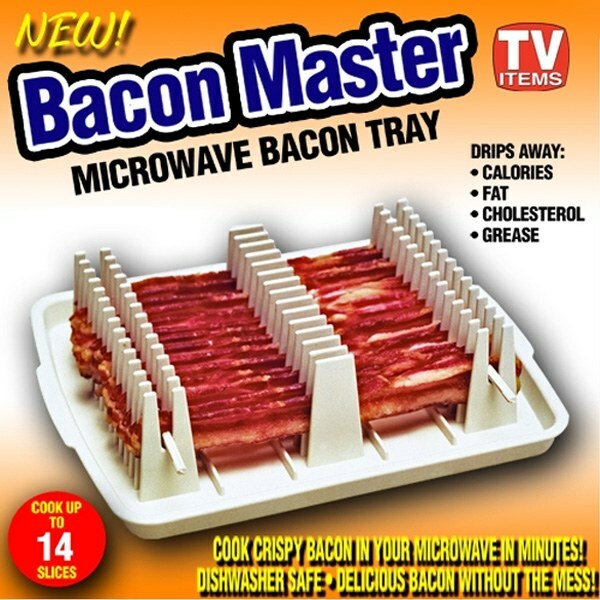 The bacon Master is specially designed to trap the grease, so that it doesn&apos;t make a mess inside of the microwave.